To keep in-theme with the giveaway I'm offering (which ends today at midnight) I did another all-Julep mani. Inspired by the bitter wind fall breeze, I had intended to work with a monochromatic colour scheme. As you can tell by the polishes below, that didn't exactly work out. Haha! Each nail has two coats of each polish and after it was really dry, I added two pieces of painter's tape to make the triangles on my ring and middle finger, and then did two quick coats of Felicity. I let the gold polish set for about a minute before pulling it off. And let me say that this is the first time I've never had to clean up any bleeds. Use painter's tape, peeps! And before you paint over it, rub the edges a little bit so the heat creates a seal. #nailarttips Haha! 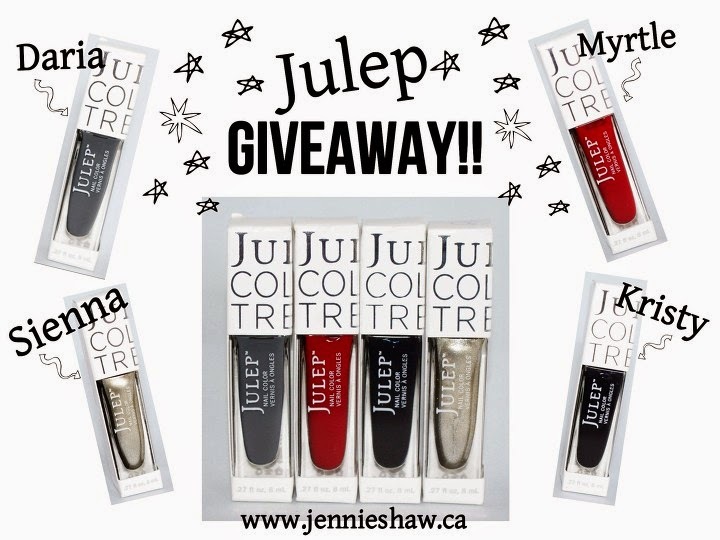 And like I've already mentioned, today's the last day to enter the giveaway for FOUR Julep nail polishes! 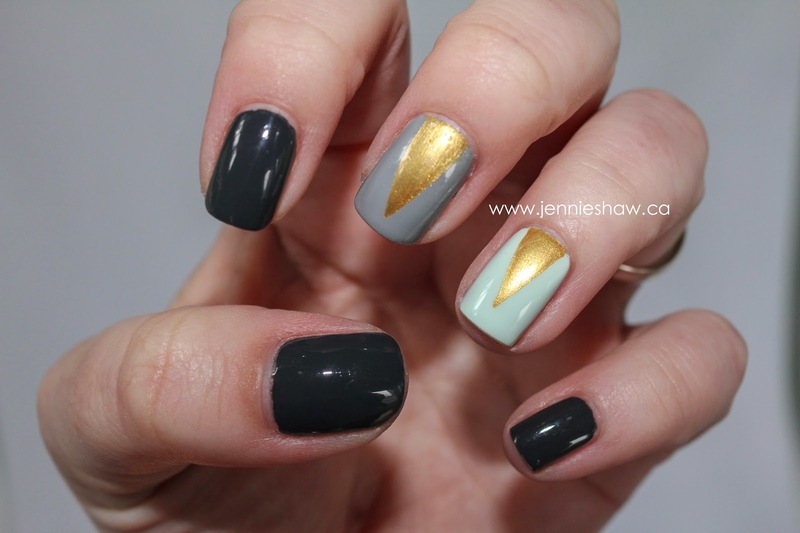 If you link up to the nail files today, you'll get another TEN entries! Woot! Can't wait to see what you're all rocking! And I hope you have a fantastic weekend! FYI, this giveaway is open internationally, as long as you're aware that the polishes may take forever to arrive at destinations outside of North America. If you're cool with that, I'm cool with paying for the postage. :) And if you already commented on the first post with your favourite fall nail polish colours, that counts as your commenting entry. Just trying to keep it fair! Art Deco anything always speaks to me, so of course I love this! Ok you have now definitely got me convinced that I need to add some painter's tape to my nail kit haha! Great colors here! 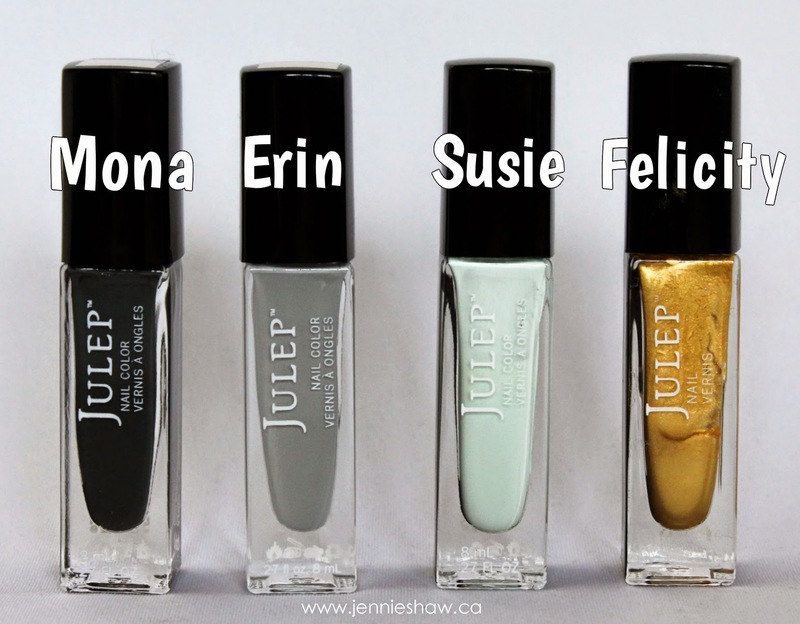 I actually don't own a single Julep polish! I would never thought to used painter tapes. Thank for sharing this tip with us all. Have a great Thanksgiving weekend. I don't know how you refrained from just using Susie on everything finger. Because mint green! I really like Mona & Susie.